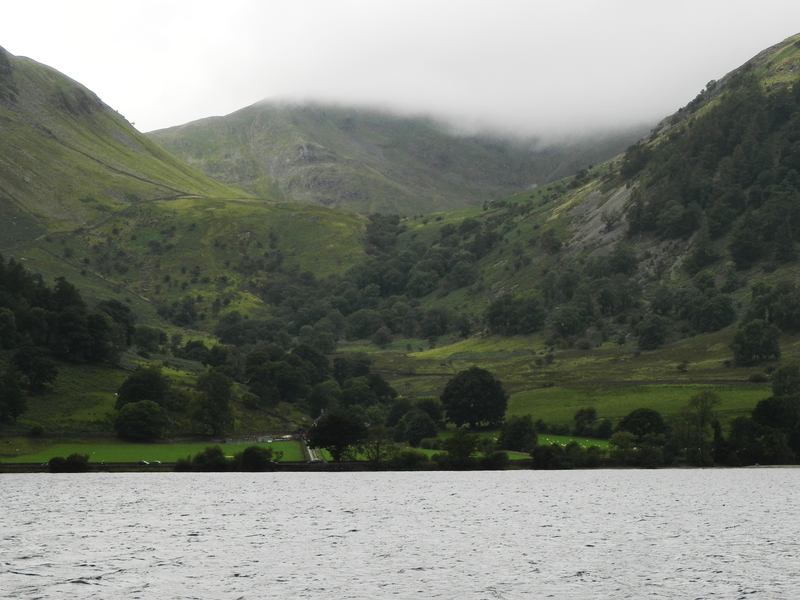 And not just a cwm or a coombe but also, possibly, a corrie or a cirque. You know, once we lived on the edge of a massive ice sheet. Here, I’m tempted to ask, just what is it with humanity? Give them an active volcano and they plant their crops on it, give them a poisonous plant and the use it as a food flavouring and give them an ice sheet and they potter around and make themselves at home on it. In fairness though, I must admit that the ice sheet in question had covered most of what they and their predecessors called home, so wandering up and down the edge of it was something to do while they waited for someone to invent coal mines and get global warming under way. The minute the ice sheet melted and they could all go home, dozens of them rushed off to climb up and down mountains and scramble about on glaciers, to ask why would be fruitless. Whatever, they gave the sort of valley shown in our photo today all those different names. It’s a sort of a cup carved out of the hills by the snow compacting and piling up layer on layer until the pressure got too much for the poor stuff so it turned into ice and slid its way out of the V shaped hole we have a photo of. Another glacier happened to be passing just then and our baby glacier was swept along in the euphoria of it all – so we have this valley hanging there, half way up the side of the hill. I know we normally deal in those ferocious denizens of the countryside – wild flowers. So, I hope you don’t mind if we peek out from our safe haven, behind the wooden chair we use to keep them all at bay, take off our top hat and bow tie, and rest on our Laurels for a moment. 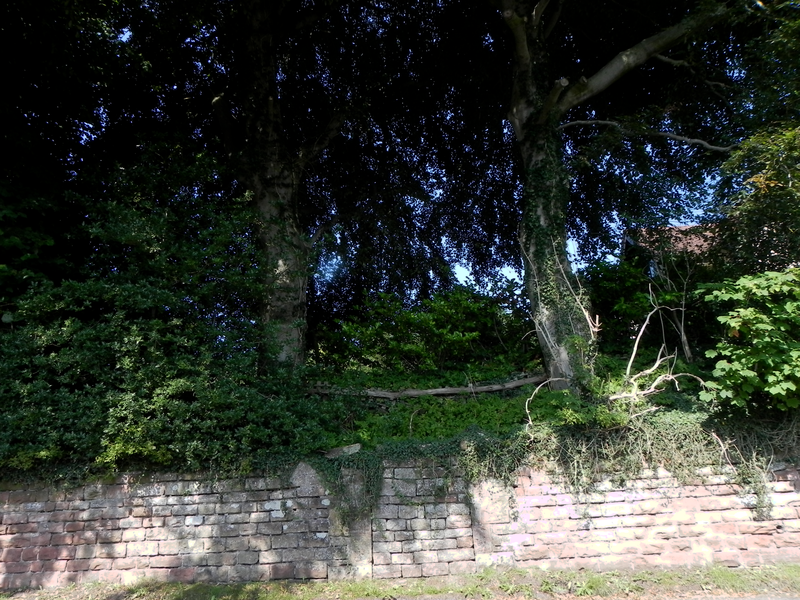 Just round the corner, as we head off downhill, in the direction of the beck, hanging over the garden wall is a large Buddleia, usually full of bees and butterflies. We often stop to admire them on our way past, but the best flowers, and therefore the most butterflies are at the top of the plant, wrapped around with foliage and outlined against the sky. In other words, not good material for a photo. Then, of course, there is the fact that it is a common or garden, completely tame, well behaved bush, not our sort of thing really. On the way past yesterday, I noticed a branch with yellow coloured flowers sticking out of the middle of the swathe of purple, so I went over for a closer look. 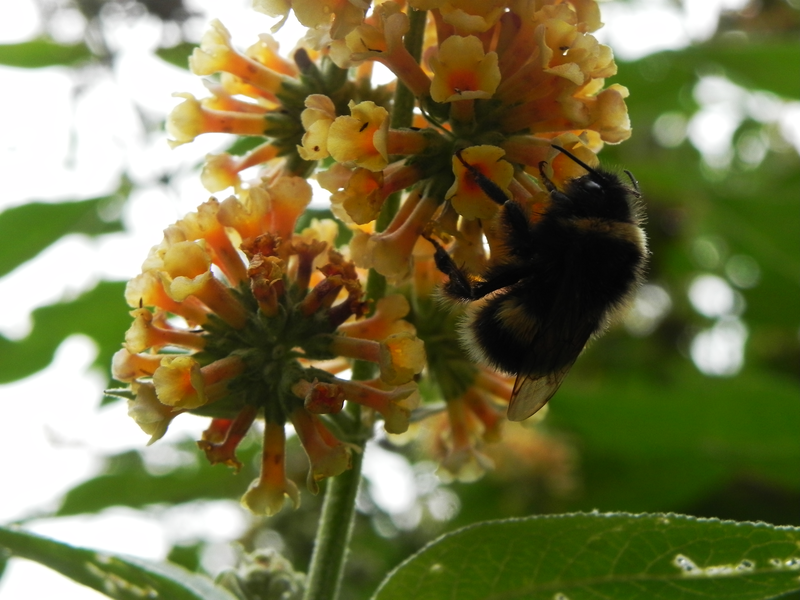 At first I didn’t believe it, but I had plenty of the normal Buddleia flowers nearby to compare with. They looked exactly the same to my unpractised eye, except one was purple and one was yellow. There is no reason that Buddleias can’t be yellow, of course, I just haven’t seen one before. While there were bees and butterflies all over the purple flowers, the yellow blooms only attracted bees. 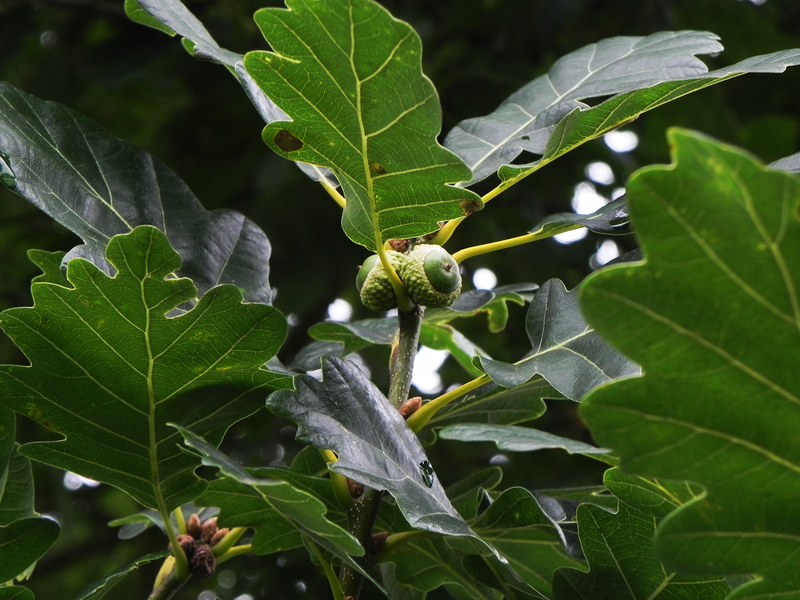 If you’ve been following our daily ramblings, of a pedestrian, both physical and written, nature, you will know that I felt aggrieved that the oak trees in the wood behind the house, didn’t seem to be in any hurry to flower in spring this year. I wouldn’t like you to think that this failure to take their responsibilities seriously was widespread in our area, and so today we have a picture of some acorns, from the trees just up the road from us. I prodded around on Google to see what he knew about acorns and oaks. I wondered, for instance if acorns were edible. Once again, we find ourselves in, you can eat it – but why bother, territory. It seems, in those olden days that we find so valuable for this sort of discussion, acorns were mostly fed to the pigs. This was a more convenient way for humans to eat acorns, as eating them directly was a labour intensive hassle. William Redhawk over at siouxme.com, offers this advice if you are collecting acorns. If the acorn is lying around on the floor without its cup in early autumn, it is probably because it has a worm in and the worm wriggling around is what has pulled the acorn out of the cup. When the acorns are ripe they fall from the tree complete with their little cups. Then it’s just a matter of drying it, shelling it, grinding it, leeching the tannins out of the flour and you’re good to go. We were on our way back home and, after crossing the beck, we started up the long hill that takes us back to the lofty heights that we inhabit. Well, I have to confess that our hill isn’t really that high but the beck has been chiselling away for ages and it makes for a brisk pace on the outward, downward, journey, but nothing like so brisk a return. 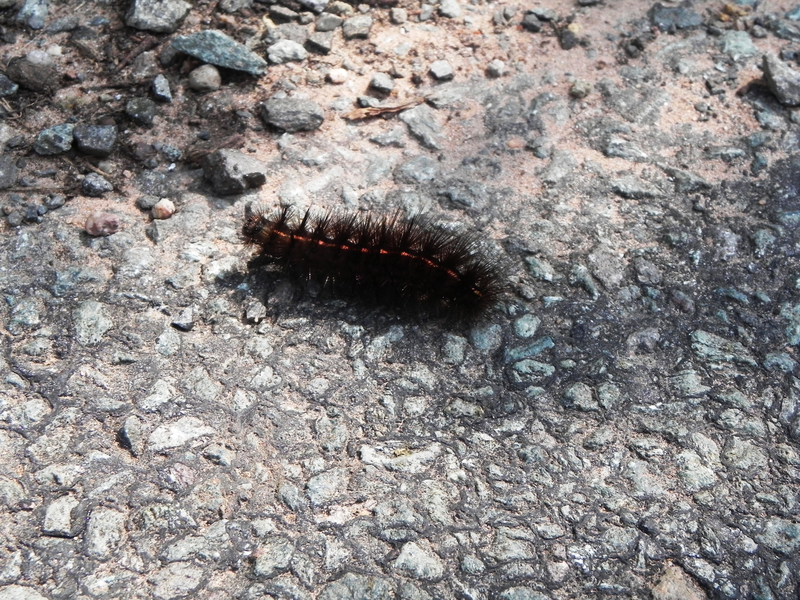 Halfway up the hill I was pleased to find this chap trundling across the road. He had remembered his green cross code and, having looked in the correct directions the requisite number of times, which I can’t actually remember myself – but I’m sure you can, he was going straight across, not dawdling, at a steady pace. I stopped, to take his picture of course, not to get my breath back, and managed to take a couple of pictures before he disappeared into the jumbled verge on the other side. On this occasion, I’m sorry to say, Google was no help at all and I was forced to resort to the in-depth knowledge of Wild About Britain. “It’s a White Ermine” came back the answer. As always, once you know what you’re looking for, Google can find you a dozen references. He may look like an ugly black bug in this guise but he is a quite stunning, brilliant white moth with a few small black spots on his wings to accent his chosen colour scheme. You might wonder how he manages, as a bright white moth, not only to survive but to be quite common, and with such obvious disregard for any attempt to dissemble, for dissimulation or even just a bit of camouflage. Simple really, once you know – he’s poisonous. Today The Dog and I wandered up to the level crossing. Here I must tell you that the last three or four days have been unbearably hot and humid. I can remove a few of my customary layers of clothing but she is still wearing her full winter outfit. At the level crossing, with both of us approaching dehydration – or possibly even dessication, The Dog pointed out that by carrying on straight ahead, down the road past the rookery, we would be under the shade of the trees. Even though it meant increasing the distance between us and our final destination, the shade ahead was irresistible. That part of the road is now strangely silent. The rooks have raised what youngsters they were able to protect from the depredations of the buzzards and moved out to forage over a wider area. There is still the occasional disconsolate mewing of a melancholy buzzard reminiscing over the time of plenty, but they too have extended their search area and are now finding that road kill is not as unappetising as they had thought earlier in the year. The road under the Beech trees is covered with Beech mast. 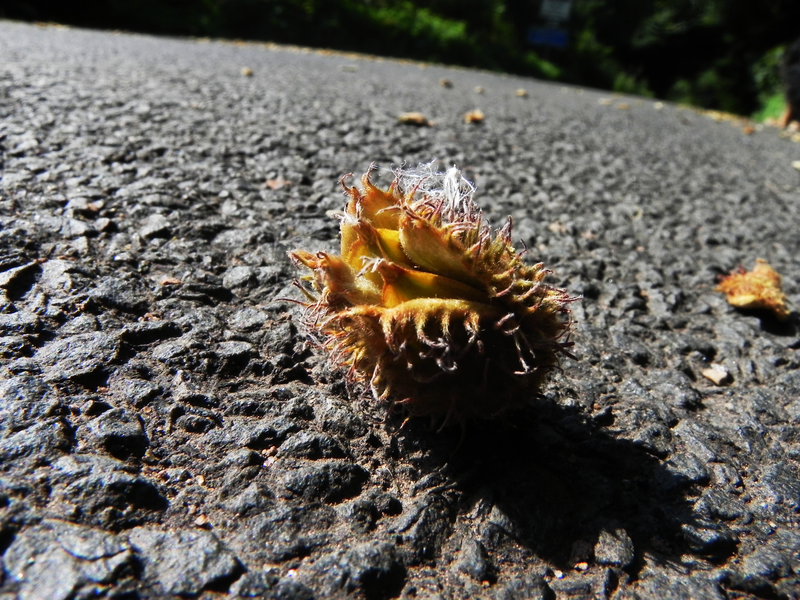 Some of them ground under the wheels of passing vehicles, but many just lying with the prickly husk partially open as if they had ripened and made a break for freedom. The nuts inside the cases proved to be totally undeveloped when we levered the case apart and bit the nuts open. Far from making a break for freedom, I think that they’ve been specifically asked to leave. We live in a faraway, forgotten corner of England. In fact we only just live in England, just inches away on the map is Scotland. Gretna Green, no longer that haven from the harsh realities of English marital law but still holding weddings at the Blacksmith’s Forge, is just one stop up the motorway. We have an airport. It was so long since anyone had flown from it to anywhere on a regular basis that, when a large transport company bought it, protests from the locals about the noise of aircraft taking off and landing, means that they haven’t been able to use it yet.In a part of the airport complex is the Solway Aviation Museum. I’ve know it was there for ages but I couldn’t imagined that it would have anything worth looking at. However, the latest batch of family to pay us a visit wanted to go and see it – they’re into aircraft and such like and that should be encouraged. The first thing we found when we arrived, was a notice saying that the museum existed on donations and was run by volunteers. I personally didn’t feel this was a good start – but we paid our moderate entrance fee an set off on the recommended route. I will just say that we found a hidden gem. I could say much more but it would be too embarrassing for me to have to admit how far from the mark my assumptions had been. It was brilliant! 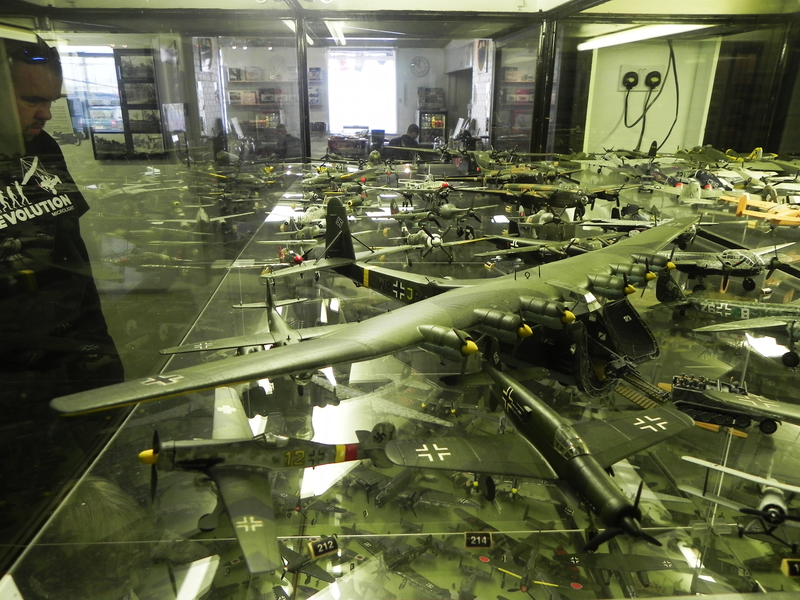 The photo at the top is one view of a very large display case full of military aircraft. I think the image below is the description of it – amateurairplanes pops in here from time to time, I’m sure he’d know.